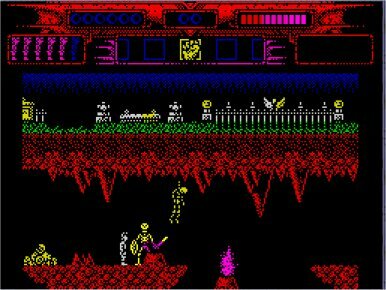 Back in the early 90s, there were few games that graphically stood out as much as Myth on the dear old Spectrum. The hardware back then, primitive as it was, could easily handle a multi-level, multi-puzzle game such as this, and indeed it did, and admirably, too. But let’s get this straight… System 3 did their research on this one. The game followed various myths and legends from different eras, from the general perception of Hell, across to Greece, Scandinavia, Egypt and finally to the final battle with Dameron, the evil demi-God type thing responsible for some kind of shenanigans up in the ethers somewhere. Basically, the slightly irrelevant plot goes along the lines of “Student with passion for myths gets hand-picked by the Gods to combat evil dark power, odds stacked against him etc.” Yes, the plot is irrelevant, as the game itself is superb from start to finish, and really doesn’t need it, the few hints in the instruction manual are enough to see you through without giving everything away. As soon as you plunge into the game (after navigating a slightly annoying menu system, but we can forgive such a small crime for the wonders you are about to experience), the first thing that strikes you is the graphics... 8-bit pixelated HEAVEN. 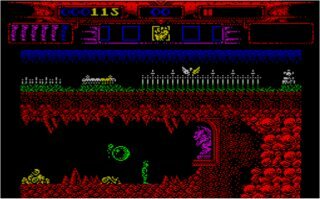 Seriously, I can't think of many Speccy games with smoother animation and THIS MUCH attention to detail. Anyway, you begin your quest plunged into the depths of hell, with several puzzles to solve and lots to do for starters. First off, the super smooth animation strikes you as your character runs along, jumping around, punching and kicking, with objective number one appearing to be to obtain some fireballs with which to bring down the essential teleport balls. These fireballs also make eradication of the nasty skeletons much easier than punching them. Fireballs, immunity and other artifacts will be found inside various chests and pots littered around, a couple of swift kicks will burst them open, and away you go. So as well as killing skeletons and collecting their skulls, you also are after the teleport balls. Shooting them enough times will cause them to drop to the floor and allow you to collect them. Collection of all these will allow you to find the teleport activator, which will then allow you to… erm… well… activate the teleport pad, transporting you to the next level. But wait! It’s not that simple! Other denizens await to try and put a halt to your progress, one of which is a demon that rises from the flames, granting you a trident that is crucial to the vanquishing of a rather impressive dragon, which in turn leaves behind a key to an extra room, where the final teleport ball must be retrieved. That’s just level 1… As you travel on your journey you must face Medusa, Vikings, Ogres, Odin, Mummies and a whole host of booby traps inside a pyramid, and with a limited number of lives available, you’ve certainly got your work cut out. But it’s all presented in glorious multi-colour, and although the final battle is a bit of a disappointment (it’s far too easy, the trials of the Pyramid prior to this are some of the finest puzzles and traps to negotiate in any game EVER) you’ll certainly feel a sense of achievement when you do manage to save Zeus and his chums from whatever Dameron was trying to achieve. So, if you haven’t already played this game, thanks to the wonders of emulation (or indeed, retro gaming), you haven’t got an excuse to miss out on some of the finest gameplay £9.99 used to buy. A remake of this should be delivered as a matter of urgency, providing the original gameplay and addictiveness is retained.